Another fab day at Jill' yesterday - Cardinal Colours - for our monthy crop. Great company and good fun - Thanks Jill. 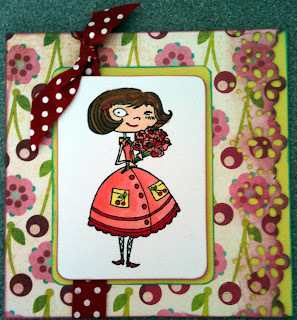 I used some of Lynn's stamps, this one is a Kimmie, I think her name is Posy. Lemonade papers were used for the base with a deep edge Martha Stewart punch down the edge and some ribbon from our visit to Snape Maltings last week. Coloured with Copic Ciao Markers. She looks great amoung the cherries and the ribbon is perfect.